Nowadays top mobile operators provided all India incoming roaming free. When we are traveling then sometimes we are going through under roaming we avoid to receive any call. But there is no problem to receive phones call. So we have no tension when we are belong in roaming. All India incoming roaming free service provided mobile operators are BSNL, Vodafone, Jio, Airtel(start 1st April,2017), Aircel (included some plans). India's largest mobile operator Airtel will free incoming call in roaming to provide very soon on 1st April, 2017 and then we are happy to receive any call in traveling time. But the question is what facility we can get in roaming? 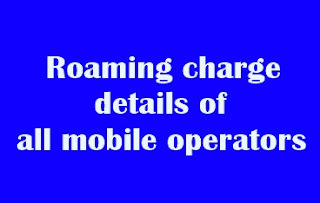 Like out going call charge, SMS charge, data charge in roaming etc. Here you can see Vodafone and Non Vodafone comparison in there roaming rates. It is applicable for all prepaid and postpaid customers. Sometime we recharge rate cutter plans or calling free plan but this plan is not working in roaming. I think Jio is provide fully roaming free service in all India based. Roaming means use of a cellular phone outside its calling area like others state in India(National roaming) or outside in india(International roaming).